A North Korean art troupe is scheduled to begin their China tour on Wednesday, which apparently shows that China-North Korean ties have risen to a new level, expanding from mutual trust between their top leaders to people-to-people exchanges. However, a liaison official at the information office of the International Department of Communist Party of China (CPC) Central Committee reached by the Global Times on Wednesday offered no updates on the North Korean group's itinerary. The official said "further information will be released on the office's website." The troupe is led by Ri Suyong, a member of the Political Bureau of the Workers' Party of Korea (WPK) Central Committee, vice-chairman of the WPK Central Committee and director of the party's International Department, the Xinhua News Agency reported on Sunday. And a Korean Central News Agency report the same day said the friendship troupe is "composed of the State-Merited Chorus of high repute and leading artists in Pyongyang." Such a line-up speaks for itself and shows that Pyongyang gives priority to friendship with Beijing, Lü Chao, director of the Liaoning Academy of Social Sciences' Research Institute for the Borderland, told the Global Times on Wednesday. Lü lauded artistic and sports exchanges between the two countries, saying these approaches can reach people on both sides more effectively. He noted now that North Korea has renewed its commitment to denuclearization of the Korean Peninsula, and vowed to shift its focus to economic development which has China's and the CPC's full support, the 2019 tour will surely be a success. South Korean Yonhap News Agency speculated on Sunday that the North Korean artists are expected to perform at Beijing's National Center for the Performing Arts, China's biggest opera house, on Thursday and Friday, and claimed that the center cancelled the La Traviata, which was scheduled to be staged from Tuesday to Saturday, to make room for the North Korean performance. An employee from the center's publicity office confirmed with the Global Times on Wednesday that the schedule for La Traviata has been cancelled, but said that the center has received no notice for arranging the North Korean show. The North Korean art troupe's visit comes closely after the country's leader Kim Jong-un's four-day trip to Beijing at the start of 2019, a year which marks the 70th anniversary of the establishment of diplomatic ties between the two countries. Kim, chairman of the WPK, has crossed the border into China and met with Xi Jinping, general secretary of the Central Committee of the CPC and Chinese President, four times in less than a year since March 2018. "Such mechanism significantly improved mutual trust on the top level, laying a solid foundation for better people-to-people exchanges, which shall lift the friendship between the two countries and the CPC and WPK to another level," Cui Zhiying, director of Tongji University's Korean Peninsula Research Center in Shanghai, told the Global Times on Wednesday. 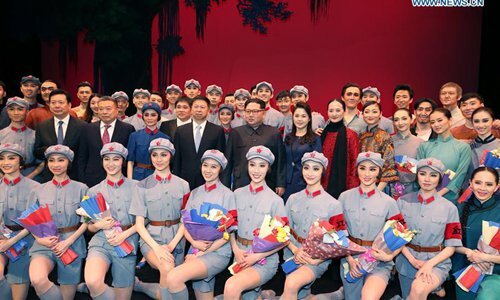 In April 2018, a group of Chinese artists visited Pyongyang and performed the ballet "The Red Detachment of Women" at the city's East Pyongyang Grand Theater. A Chinese sports delegation featuring Chinese Basketball Association President Yao Ming paid a goodwill visit to the North Korean capital in October 2018, holding exhibition games with North Korean teams.